While we were in Europe for the wedding, we took a short trip over to the Highlands to see some family and sample some Whisky. Hurricane Ophelia was bearing down on Ireland, and our flight was the last one out of Dublin airport. Despite the screaming of our fellow passengers, the bumpy takeoff did us no harm. In Edinburgh, we explored the ancient city and the met up with Rebecca's friends who took us for Haggis, naturally. We turned our toy car north the next morning and zoomed into the hills. It was a dramatic day for a roadtrip, breezy and moody with plenty of mist clinging to the empty hills. 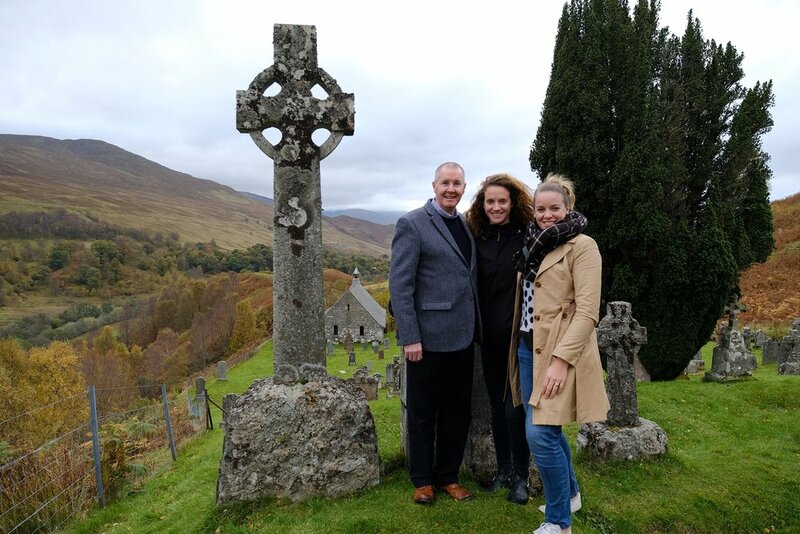 When we made it to Fort William, we met up with our beloved cousin, Highlands Counselor and whisky ambassador Duncan. He took us on the history and family tour of Fort William before whisking us to Inverness for an overnight at his home. The next day dawned bright and sunny in the Highlands seat of Inverness. In record time, we visited the Culloden battlefields, the Highlands Council, the castle, a museum, Loch Ness and a family resting place.